UAD-2 Live Rack is a 16-channel MADI effects processor for live sound engineers to craft their mixes using Realtime UAD Processing and industry-leading UAD plug-ins — including Antares Auto-Tune Realtime, right out of the box. Up to four UAD-2 Live Rack units can be combined for up to 64 channels of MADI signal processing. With its Realtime UAD QUAD Core Processing, UAD-2 Live Rack lets engineers enhance their live mixes with the world’s best analog emulations, courtesy of Universal Audio’s acclaimed UAD Powered Plug-Ins library. 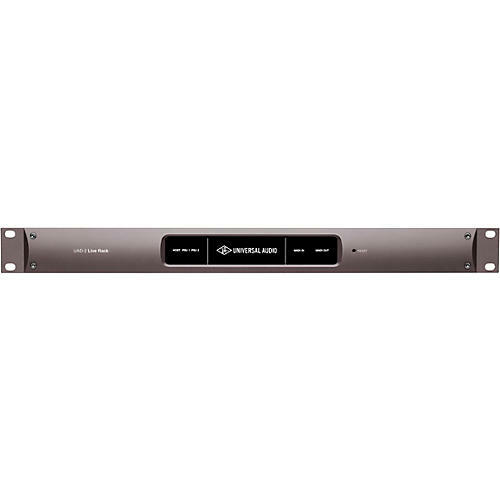 This sleek 1U rackmount processor comes with a generous suite of UAD plug-ins, including legendary 1176 and Teletronix LA-2A compressors, and Pultec EQs. And existing UAD plug-in users can readily use their licensed UAD plug-ins with UAD-2 Live Rack. Also included with UAD-2 Live Rack is the Antares Auto-Tune Realtime plug-in. Legendary for its vocal enhancing and creative applications, genuine Antares Auto-Tuning can be used in real time for pitch correction and modern pop vocal effects. With the Live Rack application, front-of-house engineers can take advantage of intuitive features such as drag and drop, copy and paste, keyboard navigation, plug-in zoom, and the ability to store and recall channel strip presets and/or complete setup configuration Snapshots. Designed for seamless operation in a live setting, the Live Rack app features large text and GUI elements making it easy to quickly tweak parameters. The Live Rack app also features MIDI snapshot recall capabilities as well as networked software integration with select Soundcraft Vi consoles. UAD-2 Live Rack includes professional, fail-safe features for reliable live sound use. Redundant internal power supplies ensure that UAD-2 Live Rack will continue to process audio if one power supply fails. If the Live Rack application or computer fails, or its Thunderbolt cable is disconnected, UAD-2 Live Rack will still process audio with the last known plug-in state intact. And with the Live Rack app in Safe mode, destructive setting changes are prevented during a live show. One year parts and labor warranty on all U.A. products and Kind of Loud products.